Last week I had the privilege of joining Crystal Cockman from the Land Trust and Nell Allen from the North Carolina Zoo exploring the flora and fauna on a property just east of Salisbury, NC. Now covered with trees and luscious foliage, this property was once the site of old forgotten granite quarries, which have left the property hilly and with large exposed granite rocks. At one point on the property, we stumbled upon an especially interesting habitat: granitic flatrock. 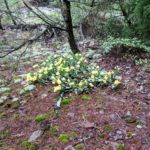 Though the granitic flatrock we experienced and flatrock in general might seem like a landscape inhospitable to plant and wildlife, it in fact fosters an abundant community of diverse flatrock species, some of which we encountered on our visit to the property. A granitic flatrock community is characterized by large slabs of granite overlaying soil, and is home to many different species of mosses, lichens, cacti, and other plants that thrive in low soil levels. Though historic quarrying on the property disturbed and likely changed the level at which the flatrock resided, we can be sure the granitic flatrock community was natural because some of the plant species we encountered only grow on exposed flatrock and not surrounding woods. Perhaps the most abundant species we encountered at the flatrocks were Grimmia laevigata, or dry rock moss, and Phemeranthus teretifolius, also known as the quill fameflower. Both plants only grow on exposed flatrock. Dry rock moss can grow into large patches, and its color varies from almost black when dry to deep green when wet. Quill fameflower is a small succulent plant native to the Piedmont of North Carolina and surrounding states. This native flatrock species produces small purple flowers up to seven months of the year that attract diverse species of bees. Another plant species we encountered at the flatrocks, and perhaps my favorite, was Opuntia humifusa, better known as the eastern prickly pear cactus. This species of prickly pear is common in the coastal areas of North Carolina because of the region’s sandy soil, but it also rarely occurs in the North Carolina Piedmont. 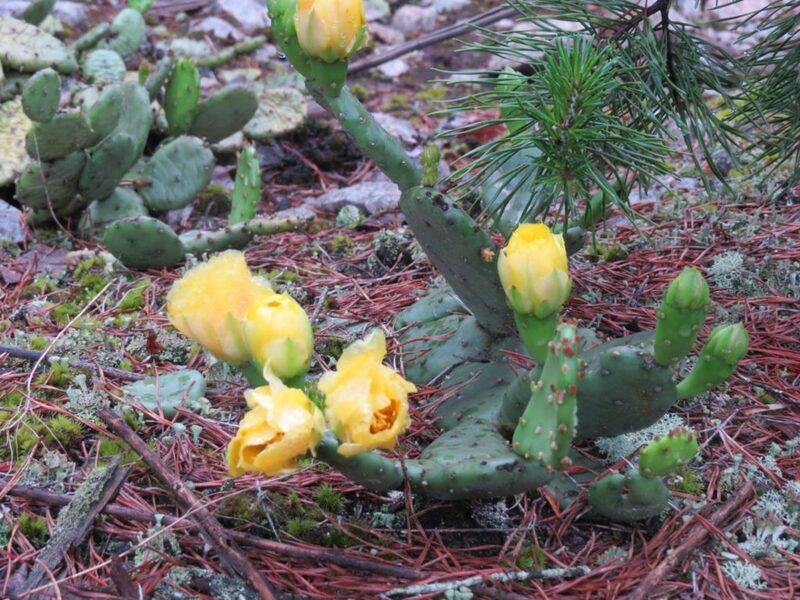 This prickly pear cactus species produces large and vibrant yellow flowers starting late spring, which later become pear shape fruit. Surprisingly, this fruit is edible once they ripen to a magenta color and the prickly spines are removed. 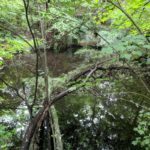 The granitic flatrock community we encountered also had vernal pools, which are temporary and shallow pools that typically lack fish but can have frogs and tadpoles. These pools are present in winter and spring months, but typically dry up for summer and fall. These pools can be the habitat for many plant species, particularly wildflowers in the Piedmont of North Carolina. These species include the state-endangered one-flowered sandwort (Minuartia uniflora). 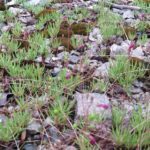 Though we did not get to see any one-flowered sandwort during our trek into the granitic flatrock community, there were patches of blooming Mononeuria glabra, or Appalachian Sandwort, as well as black raspberry (Rubus occidentalis) near the pool. 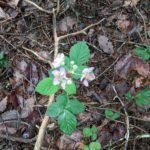 The black raspberry was especially interesting because it is both scarce in the Piedmont, and the pink flowers we observed, rather than the typical white, are unusual for the species. Though the property we explored is privately owned, the public is welcome to visit similar granitic flatrock communities at other locations. The scenic Little Long Mountain, which is part of the Uwharrie National Forest, hosts granitic flatrocks, and is a perfect picnic and hiking destination. Here, there are quill fameflowers, patches of prickly pear cactus, and other plants common to granitic flatrock communities. Dunn’s Mountain Park, which is near the property we explored, also has public access to granitic flatrock communities, as well as other family-friendly activities.